Cloria was born on February 1, 1932 in Sheridan, Arkansas to Levi Roosevelt Cooper and Philistine (Lambert) Cooper, who preceded her in death. She was united in holy matrimony to Henry Fletcher on July 20, 1953 in South Bend, Indiana. 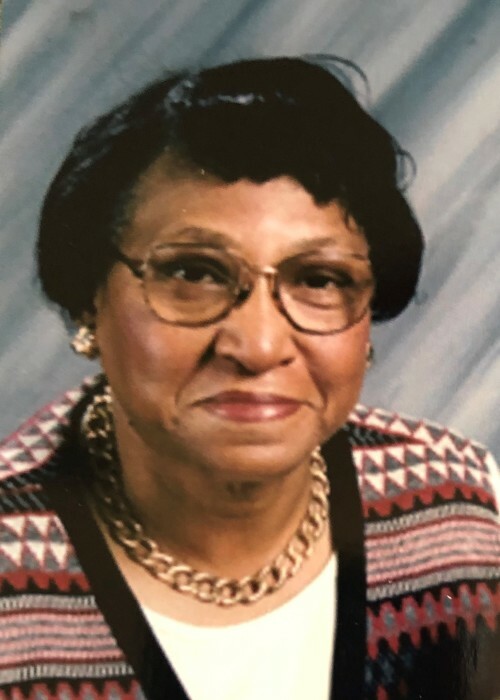 She was employed for 17 years at Robertson’s Department Store before going on to work for over twenty years for the South Bend Community School Corporation as a lunch monitor and teacher’s aide at Harrison Elementary School. She continued to work until her retirement at the age of 78. She really enjoyed being around the children and working with the teachers and missed them dearly. Cloria has been a member of Greater Friendship Baptist Church since she moved to South Bend in the 1950’s. She was President of the Mission Board until she had to step down due to her health. Pastor Davidson and members affectionately referred to her as Mother Fletcher, a title she was very proud of. She is preceded in death by her husband, Henry Fletcher, her parents, Levi and Philistine Cooper, and a daughter, Joyce Fletcher. She is survived by a daughter, Linda (Jimmie) Harris of Okemos, Michigan; two sons, Melvin (Denise) Fletcher of New Albany, Ohio; and Douglas Fletcher of Woodbury, Minnesota; five grandchildren, Aaron Coleman, Nathan (Erica) Harris, Justin Harris, and Zachary and William Fletcher; siblings, Flossie (Wayman, deceased) Walker of Troy, NY; Alcine (Jeanette) Cooper of Leesville, Louisiana; Palestine Cooper (deceased) of Little Rock, Arkansas; Calve (Jeanne) Cooper of Redfield, Arizona; Wilber (Flutie) Cooper of South Bend, Indiana; Rosetta (Henry) Junior of South Bend, Indiana; and Elizabeth (Secre) McNutt of Colt, Arizona. Interment will be at Highland Cemetery.